There's no doubt at all that the Porsche Carrera 4-Cam engine is one of the most interesting designs in the automotive industry of the 1950s and 1960. On top of that, the Fuhrmann - engine, as it was nicknamed after it's designer Ernst Fuhrmann, is probably the technically most demanding desing of it's era. From the 1st moment Porsche equipped some of it's racecars with this fabulous engine, it was clear that they did an extra-ordinary job creating it. Because of the complexity of the design of the engine, only few mechanics knew how to maintain it, let alone do a rebuild. And for the drivers : the 4-cam engine is not the engine to use in pace. Pedal to the metal and revv's up. That's what the Carrera is all about. The engine only seems to come alive at about 3500 rpm . Peter Pohl, a notorious Carrera engine expert, though it was about time to share his knowledge about the 4-cam engine with the world. And that's what this great book is all about. Peter Pohl is a foundry engineer by training who always had a strong interest in the combustion engines. Whenever he had the thime, he was working on an engine, maintaining it, rebuilding it, and where possibles reveal the weaknesses in the design of the engine and amelioriate it. After Peter Pohl bought his first Carrera powered Porsche in 1984, he started building up his knowledge about the engines as he immediately started rebuilding the 2.0 liter Carrera 2 engine. Not very long after the rebuild he acquired a very rare Porsche 356 Carrera 2 GS/GT that he prepared for racing. 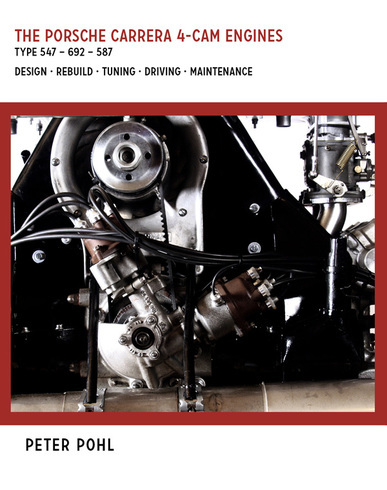 Over the last 30 years Peter Pohl has rebuilt and maintained numerous Carrera Engines. Some of the world's most renowned specialist use Peter Pohl as a reference when they are rebuilding a 4-cam engine. Ulrich Trispel, well known Porsche Author, Andy Prill, a renowned Porsche expert and Dieter Hatlapa wrote a foreword by this book that describes in a clear language anything you need to know when you own a 4-cam Carrera engine and consider doing some work on it yourself. You won't be disappointed by the tremendous amount of knowledge that can be found in this book.